STOP. In the name of love. Even in rural Indiana, traffic can be crazy. 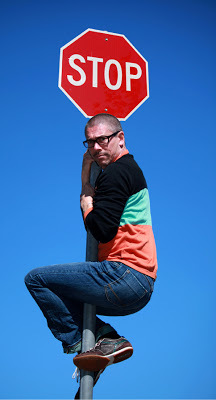 On our trip into town yesterday, at two separate intersections my husband and I watched dumbfounded as an approaching driver ran the stop sign. One vehicle we could have broadsided had we wanted to. I wanted to. We had already sidled up to the bright red octagon, come to a complete halt. Our turn to go when a man in a gray sludgebuster coming from our right slowed and drove right on through, right in front of us. I wanted to ram him. Good thing Dave was at the wheel. Me, I was wielding the December issue of The Sun, a favorite literary magazine. I often read aloud when I’m riding. A few hundred yards back I’d finished a brief piece by Thomas Schritz recounting an experience he had while waiting at a red light in Los Angeles. He watched a man who appeared to have palsy attempt to cross a busy six-lane freeway. As the man stepped out into the crosswalk Schritz thought to himself, he’ll never make it in time. He was right. The light turned green when the man was only a third of the way across. A nearby police cruiser sounded its siren and pulled into the intersection, lights flashing. Schritz grew angry as he waited for the officer to give the man a ticket. “The Los Angeles police are not known for being overly friendly,” he writes. He was surprised when the officer simply blocked all traffic until the man made his way safely to the other side. “Sometimes we all need help making it to the other side,” I’d said. Joe entered our life quite recently when he mustered up the courage to call the phone number his therapist had given him. “This is the contact information for a gay couple who may be able to offer you some support,” she’d told him. We’d been cued in that he might ring. A denizen of small-town Indiana, Joe is in the early throes of coming out to himself in mid-marriage, midlife, mid-air. He feels like he’s falling, not sure what to do, where to turn, how to find his way. Not sure he’ll survive. Over 15 years ago, Dave and I found ourselves in similar straits. More than 15 years later we are still grateful to the people who extended a helping hand, warm welcome, listening ear. We too came out in midlife. We too wrestled with how to tell our wives, children, parents, siblings and society the truth we were discovering about ourselves. There is no easy road, no one right way to exit the closet. And there are no guarantees. Not everyone makes it. Most everyone hits hard times somewhere along the way. Joe tells us he feels lonely, depressed, afraid. Feels sad, scared, foolish. Feels like a teenager. Feels like an old man. Feels hopeful one minute, then despondent for days. We’ve met with Joe a few times. We’re going out for pizza together tonight. We look forward to staying in touch, offering him the kind of support we received as we took our first faltering steps into new life. Simple kindnesses, really. Stop, look, listen. Bear witness. Offer encouragement, pointers and warm regard. After all, the traffic is crazy out there. The lights change quickly. We all need help making it to the other side.